Above & Below: OPI Suede in We'll Always Have Paris, outdoors with no flash. This is 2 coats and it was almost opaque in just 1. No top coat. This is the third Suede I've used, and I absolutely love this collection. The colors or shades are average, but the shimmer and finish, combined with the fact that the application is close to perfect in just two coats, makes this collection a winner in my eyes. These all dry extremely fast and I love how smooth to the touch they feel. We'll Always Have Paris is a medium toned plum shade with silver shimmer. This one seems to have a little more silver than the other two I've tried, but it may just be the contrast in the colors. I didn't put a clear coat over this because I wanted to wear it matte, but as most of you know, adding a clear top coat enhances the shimmer and gives it a more dimensional look. I received the exclusive Japanese Glitter today that Color Club is furnishing Victoria Nail Supply with and I'll have lots more on that tomorrow. It's a fairly clear polish with multi-colored micro glitter that is somewhat holographic, in that the glitter changes color at different angles and in different lighting. I'm playing around with it today, primarily as a layering polish and I love it! It's available on their site now, along with the other four exclusive Japanese Glitters here. I wish these suedes would hurry up and become available. It's killing me to keep looking at these and not be able to order them. I did order a zillion Zoya's today. They had their BOGO up to 6 polishes free. I ordered much more than that. I just love that Suede on you. Looks so pretty. Hurry uo OPI. Oh my word that is beeeautiful! I love this look! The texture on the suede ones are so original! Thanks for sharing. Oooh, it's purple and GORGEOUS! Getting this one for sure. Mary you are seriously enabling me with this collection, when I get my hands on it I'm totally blaming you. Haha, I don't think you'll mind! Looks fantastic enough that I don't think I'd layer a shiny top coat on it either! Hey Mary, Love the OPI colors. I am going to go online and order some soon. Polished Museaholic~a dark purple in this line would be very nice :) The COlor Club for VNS is just one shade, but it works well in changing the look over base colors. Lucy~the Suedes are slowly becoming available and I think you'll love them. I passed on the Zoya code...this time! AllYouDesire~thank you, it's a very pretty shade and I love the finish. Nail Fanatic~I would love to see them branch out...wouldn't a green be pretty? Kitty~very unique texture and I like that they can be worn this way or with a top coat. 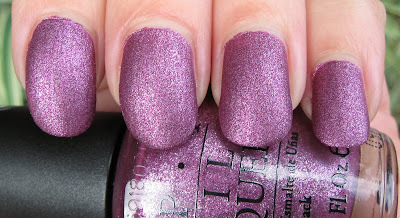 Nicole~quit blaming other bloggers for your nail polish buying habits~ha-ha! I think we all enable each other a little too much! The Princess of Polish~happy to see you! They're a nice collection and a totally unique take on the matte finish. KONADomania~thank you :) I'm glad I got all 6 of them, because it would be hard to decide which ones I wanted~ha-ha! Skye~thank you. I'm repeating myself here, but I love the finish on these. This looks lovely on you. Every time I see it, I like it so much better than the original. Must have! Mighty Lambchop~thank you. I need to see if I have the original!